Evelina felt ill today and missed church. Other Ames family members, however, attended the Unitarian meeting. Mr. Whitwell probably led the service in the typically thoughtful but unadorned style of this Protestant sect. Other services around town, such as the Catholic mass at the chapel on Pond Street, would have been more elaborate, with communion being taken, for instance, the service in Latin, and a great focus on Christ, the Virgin Mary, and various ancient saints. In Salt Lake City, many miles to the west, a different service altogether would have been held at the Church of the Latter Day Saints, known to most of us as the Mormon Church. Believers in Jesus Christ, the Mormons were, and are, a truly modern religious group, having only developed in upstate New York during the 1820s from the sayings and visions of their leader, Joseph Smith. Smith and others tried to lead his followers West to settle with more freedom than they had in the East, but ran into many problems and pockets of persecution along the way. 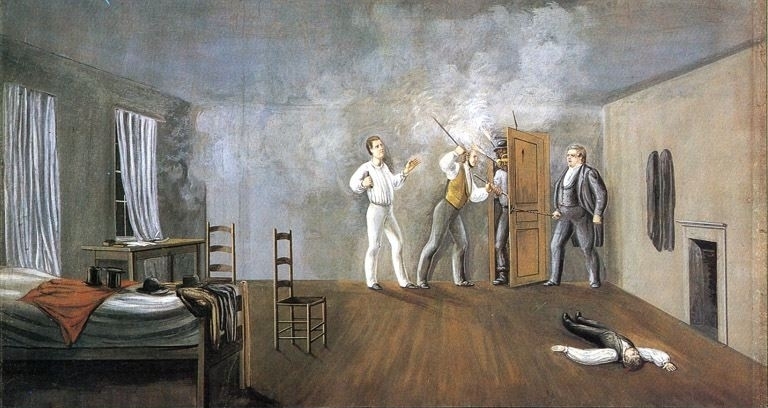 In fact, on this exact date eight years earlier (June 27, 1844), Joseph Smith and his brother Hyrum were killed by a mob while in jail in Carthage, Illinois. The illustration above is a folk painting of that murder by a 19th century artist. Smith’s followers recovered from this tragedy and found a new leader in Brigham Young (and others, known as apostles), who led them to the Great Salt Lake in Utah, where they founded Salt Lake City in 1847. By 1852, the year that Evelina is recording in her diary, the Mormons were well established there. In August, 1852, in fact, the elders of the church would approve the practice of polygamy, a choice that would bring them certain notoriety. ** They were, and are, a sect unto themselves. In years to come, Oliver Ames Jr. and Oakes Ames would have extensive dealings with Brigham Young over railroad matters. ** In 1890, the LDS would renounce the practice of polygamy.